The world is populated with smartphones and tablets. And now more people are accessing the internet on portable devices, the online world is populated with digital media that provides a wealth of information and a culture of sharing. And for online brands, a wealth of opportunities. Furthermore, the advancements of mobile technology is altering the way we use our phones and interact with online content. Responsive web design and one-click buy buttons makes mobile shopping easier and social media can be used to strengthen your brand. The next phase of the mobile revolution will see an increase in voice activated searches and SMS will be incorporated into more marketing campaigns to guide shoppers along the purchasing path with one tap of the screen. Given more than 65% of US shoppers own a smartphone, the smart approach for marketers is to create rich content that is specifically designed for mobile users. Handheld devices make it easier for brands to communicate with customers directly and by incorporating SMS marketing strategies into the customer journey, you can reach your audience anytime, anywhere. To date, online businesses are doing very little to effectively engage consumers on mobile phones. That gives forward-thinking and fast-acting marketers an advantage of stealing the soap before your competitors jump in the shower. HTML5 has dramatically improved the performance of digital storefronts on mobile devices. As a result, targeting mobile users with engaging content and persuasive ads provides marketers with a platform that has several distinct advantages over other digital channels. The biggest difference between mobile platforms and desktop devices is that smartphones and tablets are more interactive for the user. The native functions give marketers the opportunity to engage customers physically and emotionally by building tap, swipe, scroll, pinch and shake actions into content. Because mobiles are intimate devices, they also promote the sense of “personalized” marketing. This plucks the emotional strings and helps brands to build an affinity with consumers. Receiving ads via SMS also feels less intrusive. Consumer reports suggest 9 out of 10 mobile owners want to communicate with brands via a text messaging service. Now that HTML5 enables brands to create include animation, video streaming, interactive content and other engaging visuals, tests show that rich media designed for a mobile audience is outperforming static ads. Rich media is also easier and more affordable to create in 2017 than it was in the past. If it’s not in your marketing tool box in 2018, you could be missing out. The world is fast-paced and consumers want immediate gratification. Rich media delivered to mobile phones plays into the hands of end-users when they most need a distraction. And there are various powerful ways of creating engaging mobile content. Marketers are aware that digital content has to be engaging in order to retain the interest of customers and compel them to take the next step. Because rich media is fresh, modern and unique, brands have a higher opportunity to increase interaction rates and direct more traffic to landing pages. The growth of video marketing grows exponentially year-on-year. And because visual content is easier to consume on small screens, consumers prefer to watch a video than read a lengthy article. From a marketing perspective, you can actually reveal more about your product in a video than you can anywhere else on your website. Rich media not only furnishes customers more information, visual images are recalled by the brain much more easily. Brands can therefore increase brand image and recognition. And with superior tracking capabilities, you can determine which content and which marketing channels are performing and which require tweaking. A survey conducted by OpenMarket revealed the majority of Millennials prefer to text than talk. The reasons given were that texting is less intrusive than a voice call and 53% of respondents said they prefer to communicate by SMS than by phone. Since 2008, the number of minutes spent on phone calls has dropped significantly. In the same time, the number of text messages sent has increased. Texting is a growing trend among Millennials and us unlikely to fizzle out any time soon. The main reasons for texting are because they are convenient and easy to use, less stressful than talking and easier to recall information. Furthermore, marketers can include videos, links and discount coupons to publish a diverse range of content and drive customers to the next stage of the purchasing path. Customers also want to receive valuable information about brands and their relationship with companies. For example, 75% of millennials would like to receive information about appointments, account status, deliveries, promotions and coupons. Mobile users are also more open to surveys. An estimated 30-40% of consumer questionnaires are performed on mobile devices. Customer retention is vital to modern businesses. Whilst consumers have so many options, brands have to consistently find ways of providing unique customer experiences that build emotional bonds. In a saturated environment, digital companies have to find ways of standing out against the competition and retaining customers once you attract them. The personalized experience and convenience of smartphones provides marketers with a platform to easily reach customers and lead them in the right direction. Furthermore, if the majority of visitors to your website are visiting on mobile, you know the bulk of your buyers are mobile users. 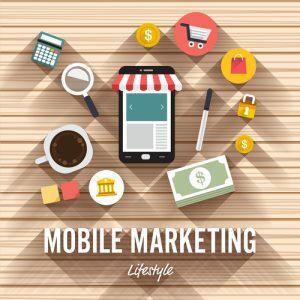 Taking advantage of mobile technologies is not only the best way to communicate with your customers but the easiest way to reach them. Over 90% of SMS messages sent by brands are opened! Furthermore, texting gives both you and your customers time to respond in your own time. Other than phones calls, SMS is the only way you can guarantee you will be able to contact customers immediately regardless of where they are. Texting gives brands the edge over competitors, enables you to grow your customer base and strengthen customer loyalty. By taking advantage of SMS marketing services you have a powerful tool that can help improve digital marketing campaigns through mobile platforms.